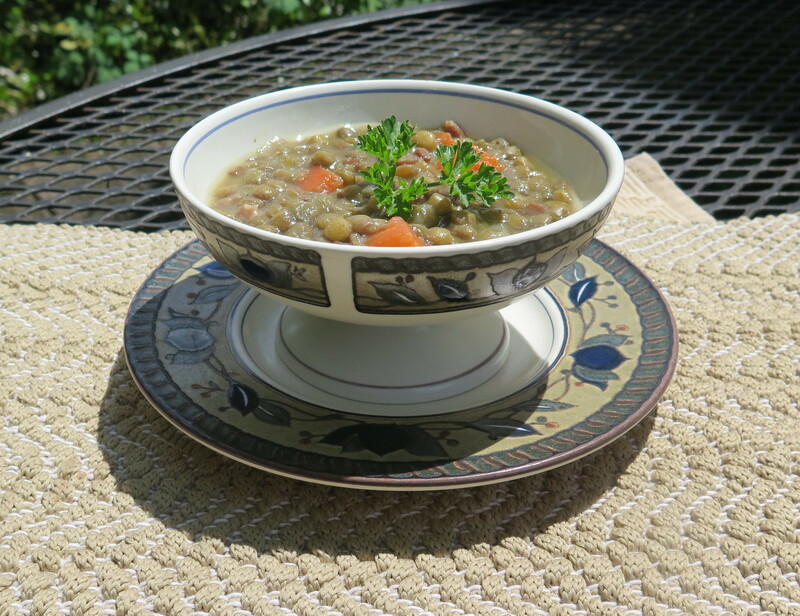 Years ago, Bon Appetit carried a recipe for “Uncle Walter’s Legendary Lentil Soup.” It was delicious; a soothing and filling soup. That sold me on lentil soup. Lentils have an earthy flavor that combine well with carrots, parsley and other seasonings. This soup is based from a recipe on the Camellia bean package; I’ll keep looking for my old Bon Appetit recipe. Lentils are a dried legume or pea. They grow as two beans in a pod! They are quicker to cook than other dried beans — you don’t have to soak them overnight — and they have lots of nutritional benefits. Lentils are shaped like a lens, hence their name, and can be brown, black, red or green. One nutritional benefit is that lentils are high in fiber. According to the “Dry Bean Quarterly” and associated research, legumes (including lentils) are related to lower cholesterol levels, lower levels of type 2 diabetes, lower waist circumferences and body weight in adults. The fiber in lentils is the type that prevents blood sugar from rising rapidly after meals and helps prevent absorption of cholesterol. And these things are good for all of us! In addition to fiber, lentils provide folate, minerals such as iron and magnesium, phytochemicals and protein. They contain virtually no fat. The high protein and iron content if lentils is important, making them a good substitute for meat in the diet. Compared to other beans, lentils are easier and quicker to cook. No soaking is needed, but it is wise to sort the beans and rinse them to remove any foreign objects left from the manufacturing and packaging. For the soup, I sauteed the onion, garlic, celery and ham in a small amount of oil, then added the lentils, chicken broth, water, salt and pepper. The lentils cooked for about 60 minutes,absorbing alot of liquid during cooking. You can always add more water if needed. I added diced carrot and parsley in last the 15 minutes of cooking. If desired, pass red wine vinegar when serving the soup and a fresh sprig of parsley. A pound of dried beans makes a large pot of soup. It was more than we could eat in a meal, so I froze the remainder in small packages to thaw and eat later. Camellia Lentils are a product of a New Orleans company, L. H. Hayward and Co. According to their website, “by 1984, 95% of packaged dry beans sold in New Orleans were Camellia Brand.” It’s a four-generation family company, still locally owned. Camellia is a familiar brand in grocery stores here where I live, too. The quality of the beans is always excellent. I like to use local products, but any brand of beans is fine. Heat oil to medium high in large soup pot. Add onion, saute 10 minutes until translucent and cooked, lowering heat to medium to avoid burning. Stir frequently. Add garlic, celery and diced ham and cook about 2 minutes longer. Add chicken broth, water, salt (optional), black pepper. Bring to a boil. Then reduce heat and simmer for 45 minutes. Add diced carrot and parsley and cook 15 minutes longer. Ladle into serving bowls, add additional parsley for garnish, if desired. Pass red wine vinegar and add to taste. 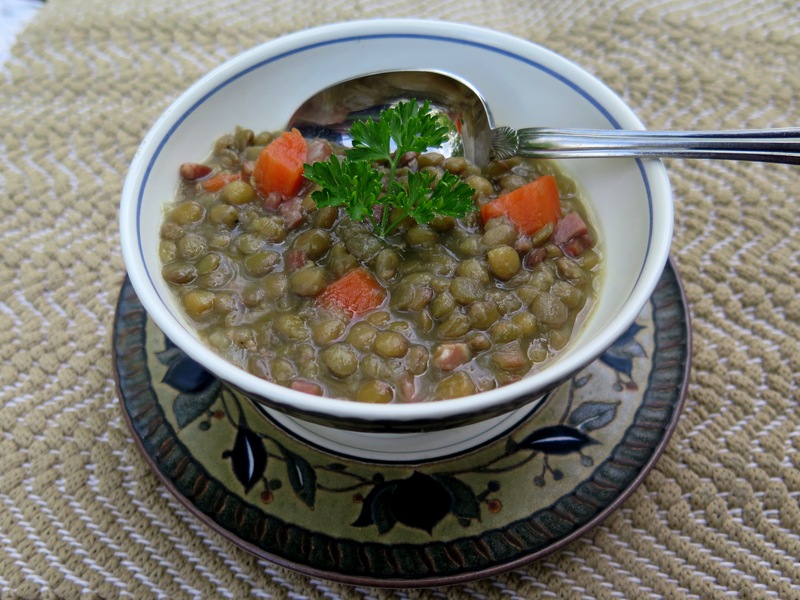 This lentil soup is quick and easy to make: a soothing and satisfying soup. Try it! Lentils. The Worlds Healthiest Foods. 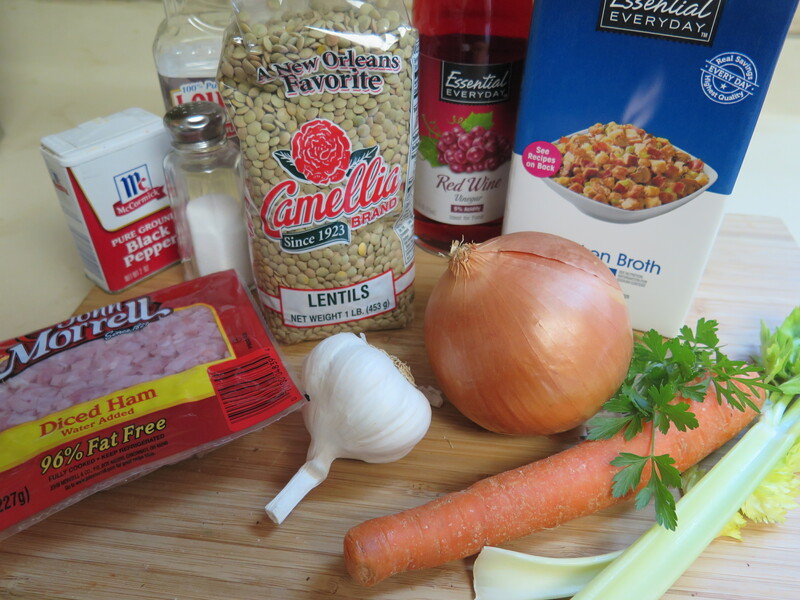 This entry was posted in Nutrition: The Cutting Edge, Recipes and tagged Camellia Brand Beans, healthy soup, lentil soup, quick and easy soup by Maylee at Beyond Gumbo. Bookmark the permalink. This looks great! I have really been on a lentil kick lately. Thanks for sharing this one! Thanks! And for stopping by my blog. The soup is very tasty! Hello, Actually I did find the recipe. But, thanks for the offer! Hope to make and feature a couple of dried beans and lentils recipes this fall.